Incorporating single-channel receiver and an external PIR sensor / transmitter. Perfect for protecting a single farm entrance or a gateway. 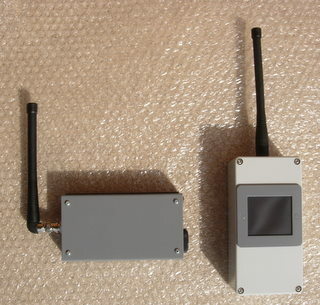 Detection range of the sensor is 30m in a `beam`, and the transmission range from sensor to receiver is 400 - 500m line-of-sight. With walls, trees and other obstacles between the sensor and receiver, this range may be reduced to perhaps 250m. Greater transmission range - up to a mile, can be achieved using a receiving antenna from our FarmGuard range. The sensors are powered by a pair of alkaline (e.g. Duracell) AA batteries, which will last a year or more. Low sensor-battery warning is provided at the receiver. If several entrances are to be protected, see our multi-channel systems. Absolutely superb. We've had a FarmGuard system in place for 14 years now, and it's still going strong. I've lost count of the number of intruders we've rumbled with it.